First published Aug 21, 2018. Updated January 15, 2019. What factors influence your child’s eating habits? Strong links have been shown between taste preferences during early childhood and taste preferences during teenage years and adulthood. So, if your child is constantly craving sugar, it can stick with them into their teens and adulthood. Not so surprising! 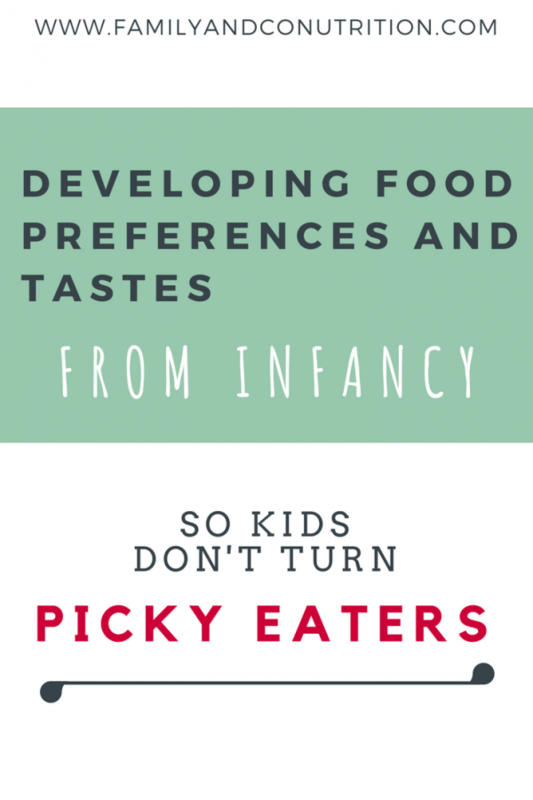 Even more reasons to encourage food exploration early in infancy. 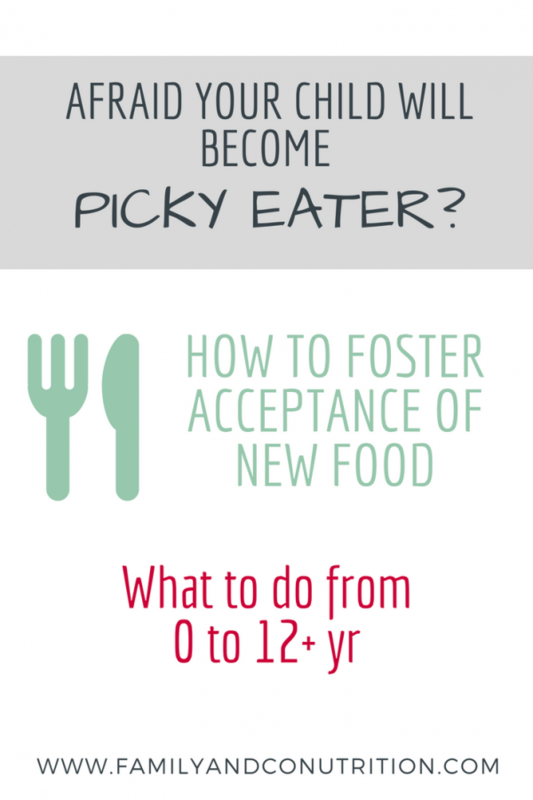 This will create a foundation for food acceptance later in life. 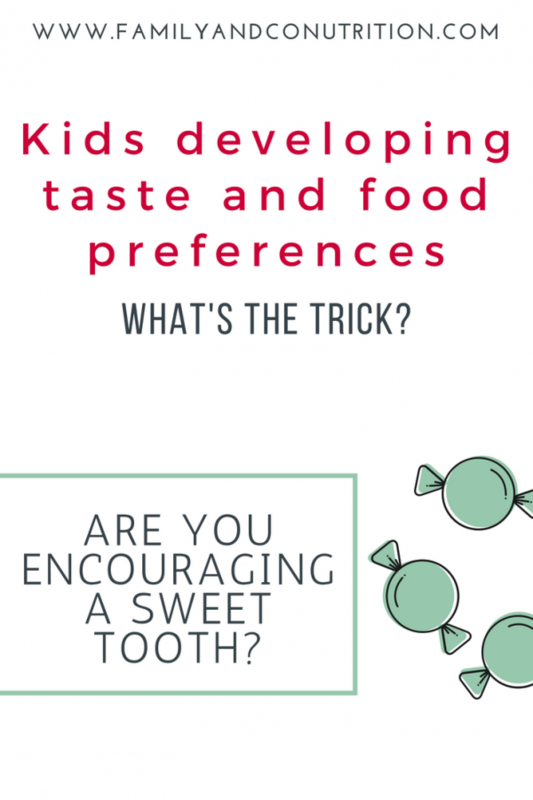 Your kids (just like you) can indeed develop a sweet tooth, but how much is acquired vs innate taste preferences? What are taste and flavour? Taste and flavor are really at the core of food preferences. Taste = the sensation of tasting something is due to the gustatory system being activated. There are 6 tastes: sweet, bitter, salty, sour, savory, and umami (the latest addition to the list! You can taste umami in parmesan, mushroom, soy sauce, meat…). Odor = the sensation of smelling something happens when your olfactory system creates smell sensations. More than thousands of different odors have been described to date! Flavor = the sensation of appreciation a flavor comes when tastes, sensation and odors come together. It all happens in the mouth, as your tongue covered with taste papillae allows for tasting, and the odors travel from your oral cavity to your nose (after all, it’s all connected!). That explains why you don’t taste much when you are sick and have a congested nose. The connection between your nose and mouth allow you to smell and taste, ultimately appreciating complex flavors! Taste development: are you encouraging a sweet tooth? Scientists consider the first 1000 days of life as a sensitive period for your child to develop healthy eating habits, including the appreciation of different tastes. And no, we aren’t talking since the day your child was born. Crazy right? It begins in the womb! If you make the calculation, 1000 is the number of days from conception until your child turns 2 years old! That means mamma that your food preferences and eating habits during pregnancy DO end up influencing your child’s taste for various foods. 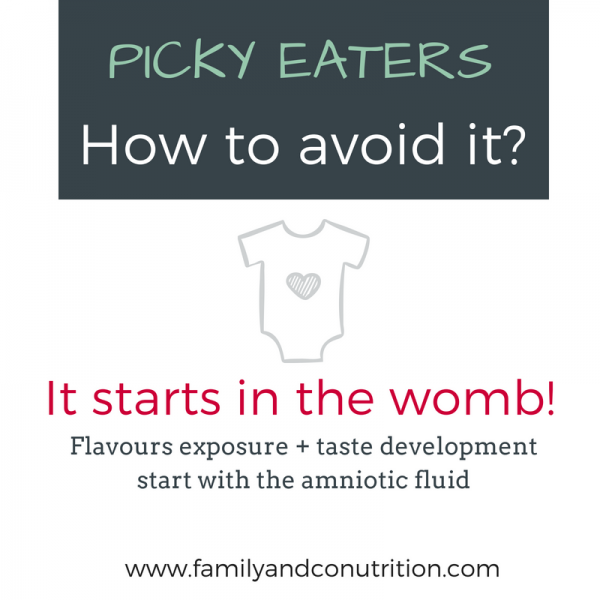 In the womb, baby is surrounded by the amniotic fluid which contains a lot of molecules derived from the mother’s diet: nutrients, glucose, amino acids…all of which have a particular taste. That means that babies are already learning how to perceive flavors in utero as they develop their gustatory and olfactory systems. By the end of pregnancy, baby has a fully mature gustatory and olfactory system, and the 9 months in the womb have prepared her/him for postnatal tasting experiences. A baby is born with fully developed and mature olfactory and gustatory systems. Bring on the flavors! Breast milk and formula: does it taste good? Although born with fully developed systems to taste and smell, your baby still develops her/his neural system to process all this information and refine the sensory perception. It continues through breast milk, which truly reflects the taste profile of the food eaten by the mother. Breast milk is fairly sweet, but still contains a lot of tasty molecules derived from the mother’s diet! By contrast, formula milk doesn’t offer the same flavor profile. It is a static taste profile that doesn’t change, unless you change brand or type of formula. 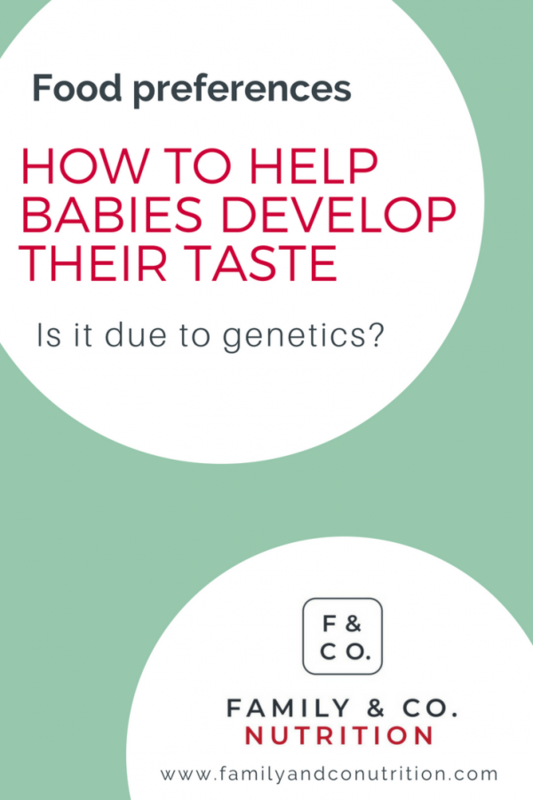 How do I know if my baby likes certain flavors? 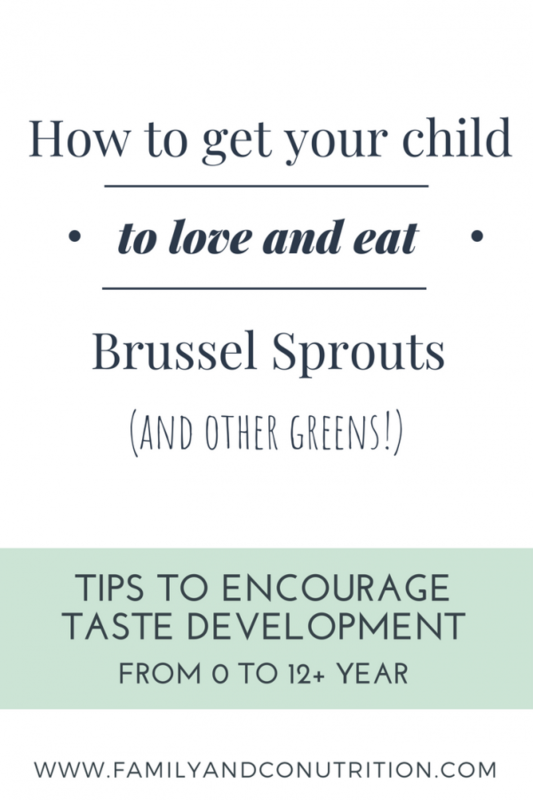 How do I know if my baby dislikes certain flavors? Breast milk is full of flavors based on the mother’s food consumption. Introduction to solid foods: explosion of flavors! 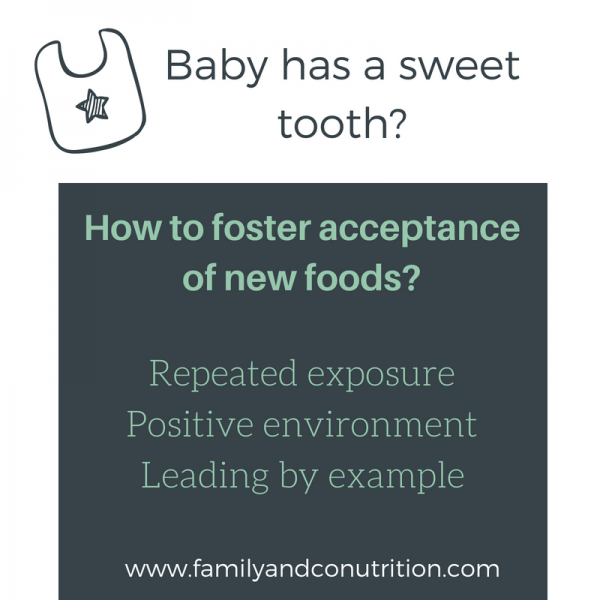 Introducing solid foods to your baby is the start of a whole new experience! In addition to a range of flavors, your baby starts to be exposed to different textures. It is important to respect the recommendation to not add sugar and salt to food offered to babies, as it allows them to taste all the subtle flavors of food and get a taste for it *pun intended! It will build on the foundation laid down in utero and in early infancy. Solid foods offer the texture and sensation component that is so important when developing food preferences. A lot of factors play in the development of taste and food preferences: from amniotic fluid and breast milk taste to health and economic considerations! Hard-wired for a sweet tooth? By nature, humans have a positive preference for salty and sugary foods, while least preferring bitter foods. Children are no exception; they prefer foods that are high in energy (sweet tastes usually signal “energy”), and may tend to reject bitter food (bitter tastes usually signal “poison”). We ARE fighting out nature here. Scientists believe this predisposition to high-energy foods was shaped by our evolution, when such foods were scarce. It would make sense! We are born to prefer salty and sugary food, and to avoid bitter food. Blame it on evolution! Food preferences and healthy diet: a matter of genetics? It seems like food preferences would be partly explained by genetics! Preferences for food rich in proteins, fruits, vegetables and desserts would be the taste preference mostly inherited from the mom’s and dad’s genetics. It might sound surprising at first, but it really ties back to the inheritance of the taste perception and preferences. And all these are linked to specific genes. Have you ever done the classic science test to detect if you are a “supertaster” or a “non-taster”? You place a little paper strip on your tongue and you know instantly if you detect and taste bitter flavors or not. It is either a boring experiment if you don’t taste anything, or a pretty intense one if you happen to be a “supertaster” and detect that flavor quite distinctly! The strip is coated with phenylthiocarbamide (PTC), a bitter substance that only 25% of the population is able to taste. The supertasters have a single polymorphism in the gene that encode for the taste buds detecting that bitter flavor. Genetics is at fault here! Food preferences are linked to taste sensation, and part of it is dictated by our genetics. 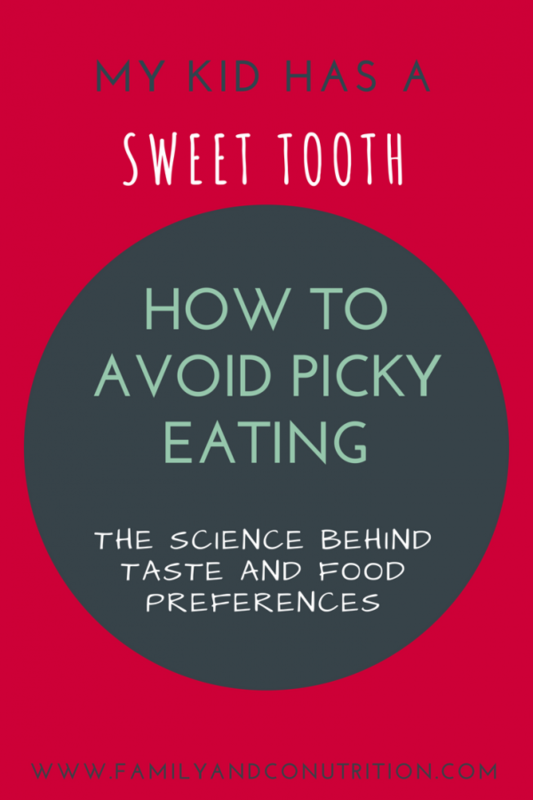 Are taste preferences influencing food choices? How can genetics influence your child’s food choices? Well some children are supertasters, and are then particularly sensitive to bitter tastes. Their sensitivity makes them dislike the consumption of bitter foods such as cruciferous vegetables (i.e. cabbage, broccoli. And Brussels sprouts) because these contain a lot of bitter molecules, including one called 6-n-propylthiouracil, a compound tasting similarly to this PTC. Supertasters seem to detect flavors others can’t, or taste the flavors with much more intensity! In comparison of children who are unable to taste this chemical compound (“non-taster”, which is the majority of the population), these kids might have a valid genetic reason to refuse to eat their greens! Your child’s ability to taste bitter compounds not only influences their dietary patterns, but also how it can affect their health long term. That’s okay, because as the classic nature vs. nurture debate goes, children can overcome genetic predispositions through additional dietary strategies and repeated exposures! Your child has a sweet tooth and LOVE desserts? Great. That is not a problem in itself. As the parent, you are in charge of deciding What, When, Where. What type of food is offered. Sometimes there is a dessert, sometimes not. Sometimes we go for ice cream, sometimes not. Sometimes the dessert is a decadent chocolate brownie, sometimes it is fresh berries… You decide what fits with your family values and preferences. Restricting or completing banning certain foods is never a good idea. Restriction leads to cravings and binge-eating, with our without feelings of guilt. We don’t want that for your children (nor for you). We are fostering a healthy relationship with food, and that means all foods are part of a healthy diet. Every food has its place on your family’s plate. Food neophobia happens when a child (typically between 2 and 5 years old) is unwilling to eat (or even taste!) novel foods. 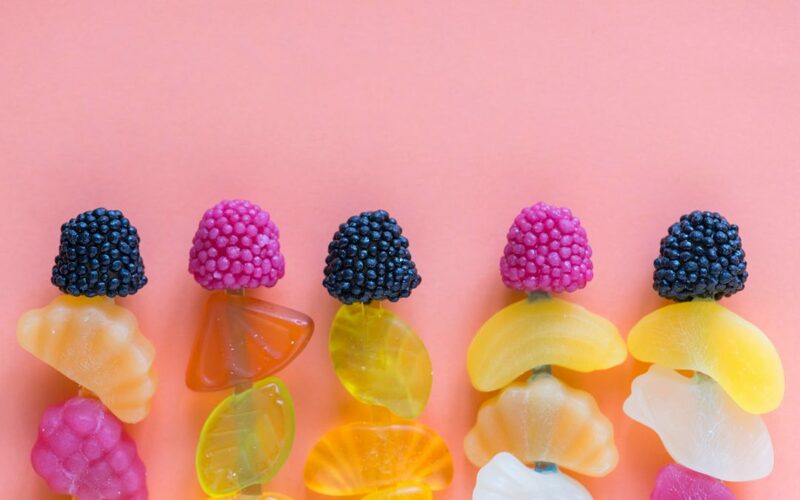 It is an adaptive behavior, and it is believed to be a way to ensure children only consume foods that are familiar and safe at a time when they become more curious and more exposed to new foods. One of the strongest predictor of children’s food preferences is familiarity. Repeated exposure and patience are your best strategies, parents! Food neophobia is a normal part of a child’s development. Science suggests that a child needs to be exposed between 6 to 15 times to a novel food before accepting to taste it. 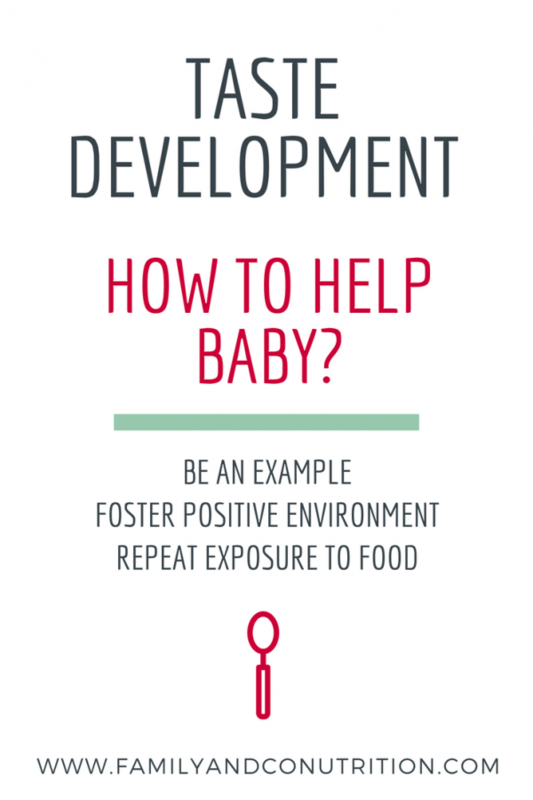 By exposure, we include seeing it, touching it, tasting it, seeing the other family members eat it, learning more information about the food… All this in a positive context and a responsive feeding environment. Forcing or bribing your child to taste or eat certain food is not a good idea. We are not fan of hiding veggies and lying to children as we want them to develop and acquire a taste for all foods, rather than eat under pressure. Fostering a healthy relationship to food means that children are not force or manipulated to eat. They are rather exposed to healthy food and trusted to taste when they are ready. We favor the golden rule where parents share responsibilities with their child. When parents are offering the healthy plate, the child should be trusted to decide if and how much to eat. A good way to get children interested in novel foods (or any food for that matter!) is to involve them early on in the cooking process. Choosing tasks that are appropriate for their age can get them interested in participating more and more in the kitchen. It is never too early… nor too late! 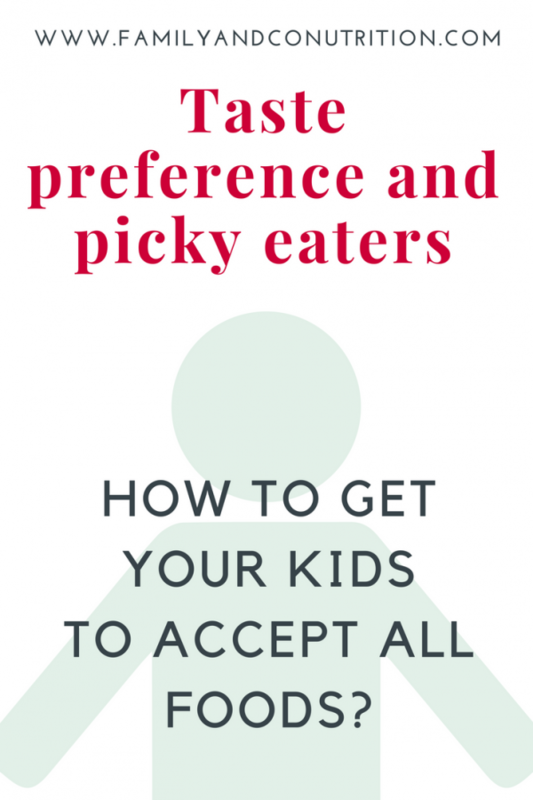 And if you have a picky eater, here are our 10 best tips to change the dynamic at the family table. Taste preference and food choices are a learning experience, and parents have the responsibility to guide their children through it. Ventura AK, Worobey J. 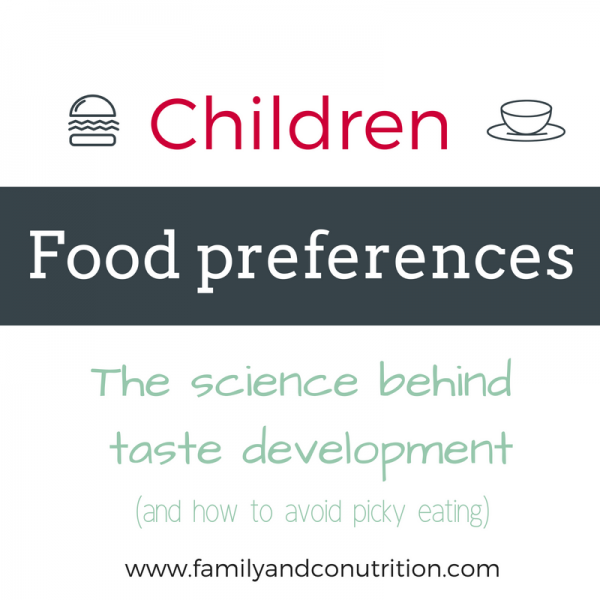 Early influences on the development of food preferences. Current Biology. 2013 May 6;23(9):R401-8. Forestell CA. Flavor Perception and Preference Development in Human Infants. Annals of Nutrition and Metabolism. 2017;70(Suppl. 3):17-25. Boesveldt S, Bobowski N, McCrickerd K, Maître I, Sulmont-Rossé C, Forde CG. The changing role of the senses in food choice and food intake across the lifespan. Food Quality and Preference. 2018 Sep 1;68:80-9. De Cosmi V, Scaglioni S, Agostoni C. Early taste experiences and later food choices. Nutrients. 2017 Feb 4;9(2):107. Keller KL, Adise S. Variation in the ability to taste bitter thiourea compounds: implications for food acceptance, dietary intake, and obesity risk in children. Annual review of nutrition. 2016 Jul 17;36:157-82. Should you eat snacks? When and how often should you have snacks? What are good snacks that will keep you and the kids going? Mom, Dad, I am becoming vegetarian! Your teen wants to become vegetarian? Should you worry? What does that even mean?